Sounds like a new artist reality TV show, but it is not. After using my Cheap Joe's brand French Easel, I decided to make a few modifications. Being a professional Industrial Designer and Inventor by day, I just could not help but make a few modifications. 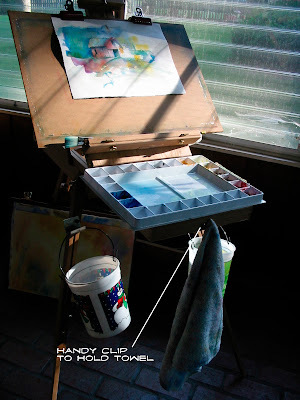 When I paint, I typically have two large buckets of water, a sponge, pallet, Windex bottle sprayer and a handful of brushes. 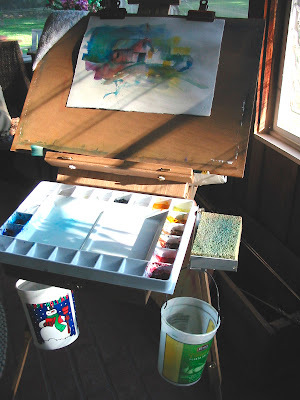 Most of the stuff stores neatly in the drawer and in the back of the easel. 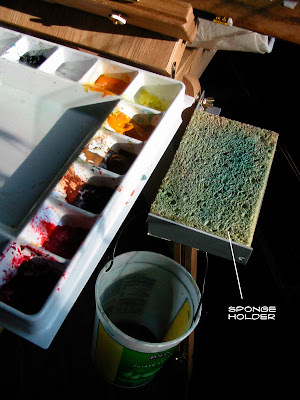 When the easel is fully deployed ready to go, I open the drawer which contains my brushes, a knife for scraping and some tissues, and place my pallet on the open drawer. To prevent the pallet from sliding, I placed 4 feet on the bottom so that they straddle the drawer on either side. 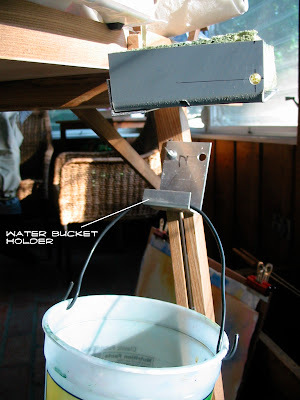 To make the easel a more stand alone unit, I needed a place to place my water buckets. The key is that they needed to be placed in an easily accessible location. I fashioned some L brackets out of aluminum and fastened them to each leg in the slots with a thumb screw and wing nut. This way they can be easily disassembled and placed in the box for transport. I thought the sponge placement would be a bit more difficult. I was able to fashion a sponge holder from a piece of aluminum angle and a piece of gray PVC flat stock I had laying around. I used a torch to heat the PVC at the desired location and bent a 90 degree angle. I attached the angle to the PVC with rivets and voila, a sponge holder. 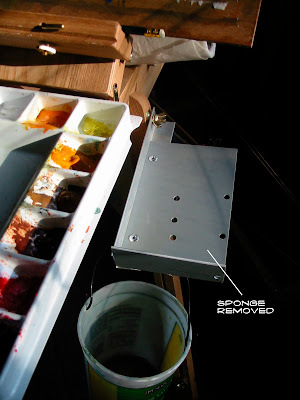 I found that attaching the holder to the leg joint on the easel an ideal location. Water bucket below, sponge above. I added a few drain holes in the PVC so that excess water will drain back into the bucket below. I also added a hook to the drawer pull to hold my towel. Stay tuned, I am sure I will have more modifications. Finally something to post! My month long design project has finally come to a close, so I can now get back to the serious work of painting! The above image was created for a Mother's Day card. I usually create all of my cards for various occasions. This one was an interesting challenge. I used the Cheap Joe's greeting cards that I purchased some time back. The painting is only 3" x 5". I am not use to working at that size. I ended up making 3 "Fancy Cards" as my wife calls them. All of the same subject. The image above was the last one I did, and one of my favorites. 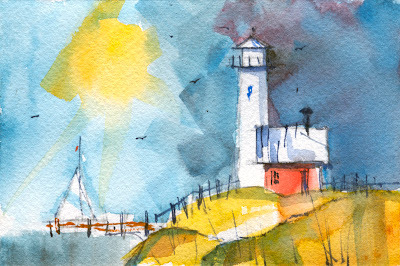 Quick sure brush strokes, completed in 3 minutes. The first two that were done took too long and looked over worked. This was a fun exercise which I will definitely do again.